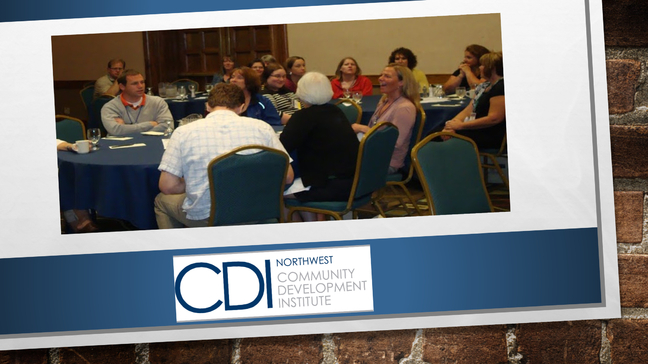 The Northwest Community Development Institute (NWCDI) is designed to train community development professionals and volunteers in the techniques of modern leadership and management of community development efforts. Since the program's inception, hundreds of community leaders from throughout the country have participated in the program. The comprehensive program curriculum is designed to meet the increasing challenges facing community developers in today's changing society and is applicable for community leaders from towns and cities of all sizes. NWCDI approaches community development as both a process and a program. It seeks to develop an individual's ability to identify community problems, set goals, encourage liaison with outside agencies, stimulate community interaction, and bring groups together to support competitive economic development, human resource development and quality of ilife issues. Organizations, community officials and volunteers associated with city, county and state government, chambers of commerce, private and public sector economic development organizations, utility companies, and financial institutions will find the Institute a valuable learning tool for the development of individual and community leadership skills. At NWCDI you will learn current strategies for sustaining strong communities, attend exciting classes from top community development instructors and develop networking relationships with other city leaders.